Matt Glucksberg is a Professor of Biomedical Engineering at Northwestern University, and the Director of the Center for Innovation in Global Health Technologies. His technical expertise is in tissue mechanics, microcirculation, and optical instrumentation. His laboratory has developed photonics-based instrumentation to measure pressure and flow in the circulation of the eye, instruments to measure the response of pulmonary alveolar epithelial cells to their immediate mechanical environment, and is currently involved in developing minimally invasive optical biosensors for monitoring glucose, lactate, and other measures of metabolic function. He is a co-Founder of Northwestern’s Global Healthcare Technologies Program in Cape Town South Africa, co-director of an MS certificate program in Global and Ecological Health, and is working with the Center for Global Health at Feinberg to develop BME degree programs at three Universities in Nigeria. 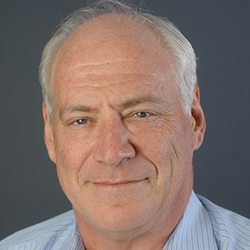 Dr. Glucksberg is a member of the College of Fellows of the American Institute of Medical and Biological Engineering, a Fellow of the Biomedical Engineering Society, and serves as a founding board member for the Northwestern Global Health Foundation.